The T-index chart: This image shows the DIFFERENCE between current OBSERVED HOURLY conditions and PREDICTED MONTHLY conditions for the Australian region. The colours blue, green, yellow, red, correspond to "enhanced", "normal", "mildly depressed" and "depressed" conditions respectively. Depressions and enhancements are with respect to the IPS predicted monthly T index for that month. see the layer conditions and find out the vertical MUF. Adjusting the "Amp Threshold" level up will mask out weaker reflections. Legend: White solid line indicates monthly predicted foF2. White dashed line indicates monthly predicted foF2 +/- 30%. Red solid line indicates hourly observed (autoscaled) foF2 from that station. Yellow solid line indicates sporadic E (foEs). Blue squares indicates hourly autoscaled foF1 from that station. Shows current vertical MUF across australia. Shows the "real time" best frequency to use to a nearby destination from Hobart. whole day. A similar series of maps like the picture above. 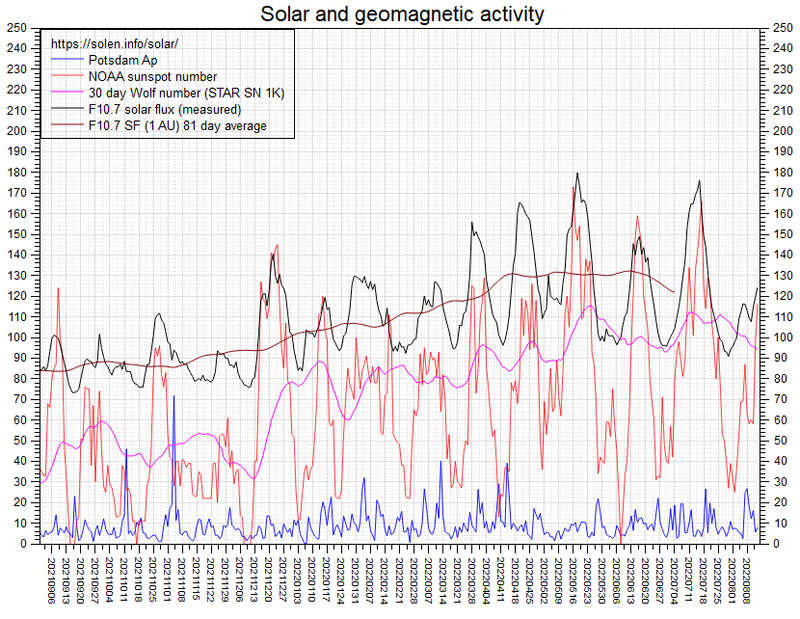 Black line is solar flux, 60 is about as low as I have seen it at solar minimum. is. Below 10 gives stable propagation conditions. Red Line is sunspot numbers.